My old girl Annie on this foggy morning. She’s the one I wrote about in Cold Comfort – The Solace of Solstice. Thanks, Mark, glad you liked it. Took it on my trusty old 1.3 MP Motorola cell phone. I would never have guessed that. 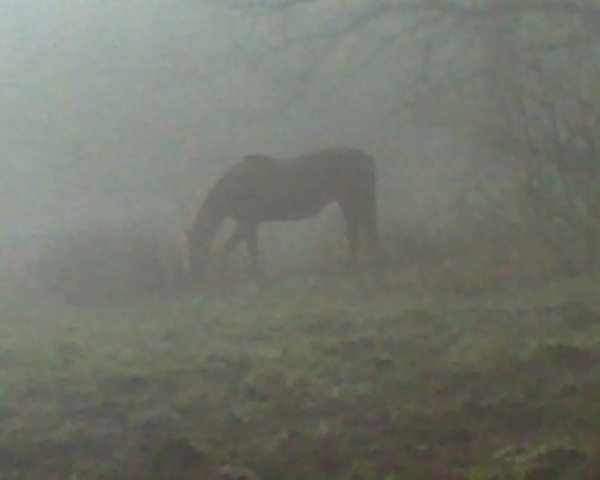 Perhaps the cellphone enhanced the quality of the fog! Thank you 🙂 She’s a very photogenic girl. Enlarging the original cellphone shot gave it a nice muted quality. Of all three of the horses, Annie is the most inclined to “pose”. Well, then, she’ll live forever in the digital world, if that’s the case! I love the mood this presents. Wonderful photo!